VATICAN CITY (CNS) — Pope Francis expressed condolences to the members of Opus Dei following the death of Bishop Javier Echevarria, who led the prelature for over 20 years. The 84-year-old bishop, who once served as secretary to the personal prelature’s founder, St. Josemaria Escriva, passed away Dec. 12. “He lived with two saints: with St. Josemaria for many years and later with Blessed Alvaro del Portillo,” the founder’s successor. “And from them he learned to be very faithful to the church, to the pope and to souls,” Msgr. Ocariz said. Born June 14, 1932, Bishop Echevarria was appointed St. Josemaria Escriva’s personal secretary in 1953. Following his ordination in 1955, he continued assisting the founder of Opus Dei until his death in 1975. 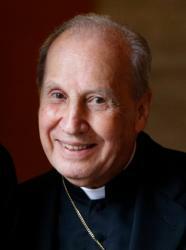 After St. John Paul II designated Opus Dei as a personal prelature in 1982, Bishop Echevarria was named vicar general. He was elected head of the prelature after Blessed del Portillo died, and was made a bishop by St. John Paul II in 1995. Bishop Echevarria’s body was to lie in repose at the prelature’s Church of Santa Maria della Pace in Rome until his funeral, which was scheduled for Dec. 15 in Rome’s Basilica of St. Eugenio.